An electronic poll simplifies the way polls are carried out and aggregates data in realtime. (These days, nobody needs to take a bus to town just to cast a vote for their favorite soccer team!) As voters cast their votes, every connected client that is authorised to see the poll data should see the votes as they come in. This article explains how to seamlessly add realtime features to your polling app using Pusher while visualising the data on a chart using CanvasJS, in just 5 steps. Pusher: Pub/Sub pattern for building realtime solutions. First things first. The survey participants or voters (call them whatever fits your context) need to be served with a polling screen. This screen contains clickable items from which they are asked to pick an option. The HTML renders the polling cards and imports axios and our custom app.js file. axios will be used to make HTTP calls to a server we will create. This server is responsible for triggering/emitting realtime events using Pusher. When each of the cards are clicked, handlePollEvent is called with the right values as argument depending on the index. The method, in turn, sends the framework name to the server as payload via the /vote (yet to be implemented) endpoint. Sign up for a free Pusher account. Create a new app by selecting Apps on the sidebar and clicking Create New button on the bottom of the sidebar. Configure your app by providing basic information requested in the form presented. You can also choose the environment you intend to integrate Pusher into for a better setup experience. This generates a few helpful files including the important entry point (app.js) and routes (found in the routes folder). We just need one route to get things moving: a /vote route which is where the client is sending a post request. At the top of the file, we import Express and Pusher, then configure a route with Express and a Pusher instance with the credentials we retrieved from the Pusher dashboard. The configured router is used to create a POST /vote route which, when hit, triggers a Pusher event. The trigger is achieved using the trigger method which takes the trigger identifier(poll), an event name (vote), and a payload. The payload can be any value, but in this case we have a JS object. This object contains the points for each vote and the name of the option (in this case, a framework) being voted. The name of the framework is sent from the client and received by the server using req.body.framework . We still go ahead to respond with “Voted” string so we don’t leave the server hanging in the middle of an incomplete request. The last step is the most interesting aspect of the example. 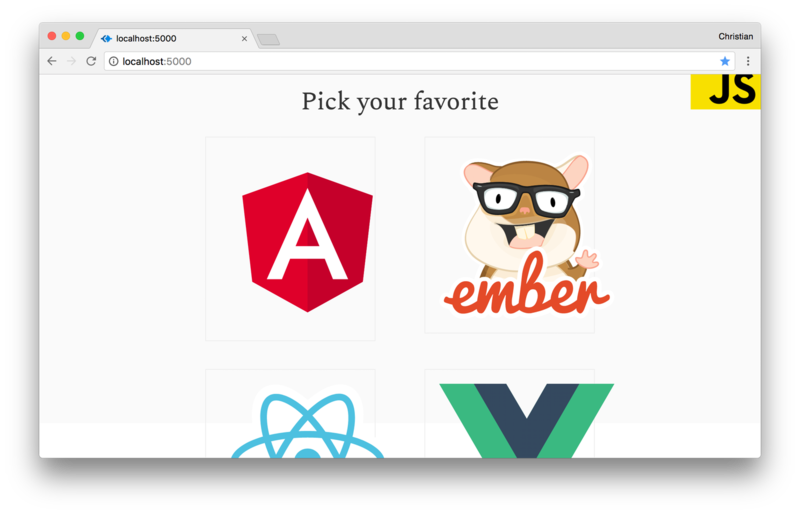 We will create another page in the browser which displays a chart of the votes for each framework. We intend to access this dashboard via the client domain but on the /admin.html route. The div with the id charContainer is where we will mount the chart. We have imported Pusher and Canvas JS (for the chart) via CDN as well as the same app.js that our home page uses. // vote cards was here. The dataPoints array is the data source for the chart. The objects in the array have a uniform structure of label which stores the frameworks and y which stores the points. 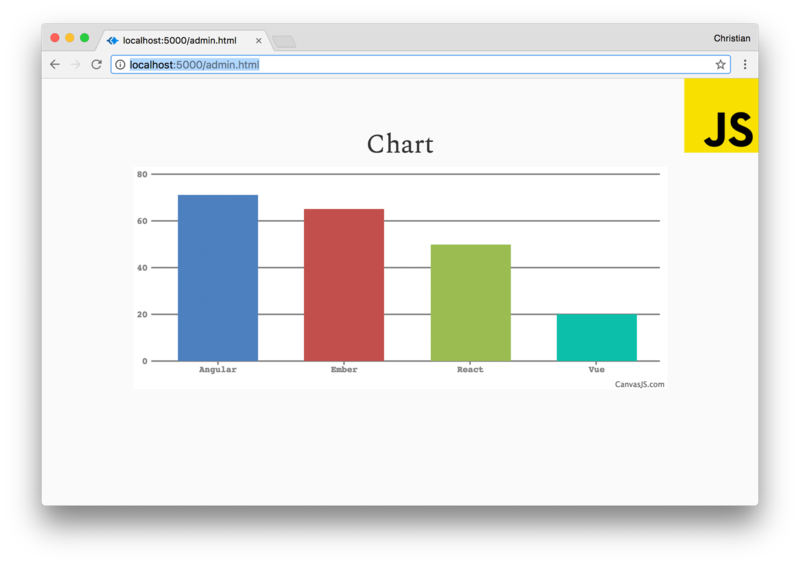 We check if the chartContainer exists before creating the chart because the index.html file doesn’t have a chartContainer. We use the Chart constructor function to create a chart by passing the configuration for the chart which includes the data. The chart is rendered by calling render() on constructor function instance. First we ask Pusher to log every information about realtime transfers to the console. You can leave that out in production. We then configure Pusher with our credentials by passing the app key and config object as arguments to the Pusher constructor function. We didn’t spend time building a full app with identity and all, but you should now understand the model for building a fully fleshed poll system. We just made a simple realtime poll app with Pusher showing how powerful Pusher can be.